Screen Magic - Stay In Touch: SMS Magic Interact v.1.30 is Out..! First of all, Thank you all for your feed-backs and reviews. 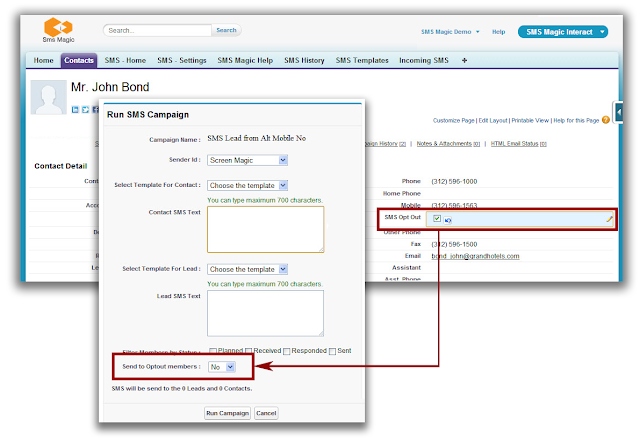 SMS Magic is a plug and play application on Salesforce CRM. 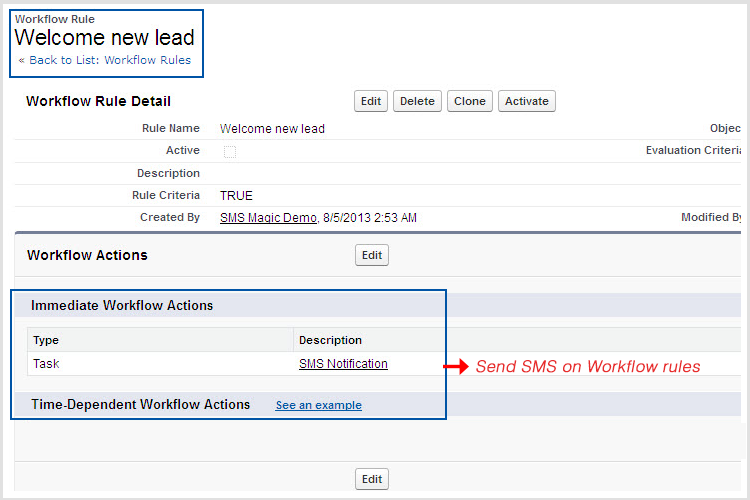 It provides the capability to send/receive SMS notifications on CRM. Our application integrates seamlessly with all the features of Salesforce environment. In pursuit to serve you better, we have been constantly evolving SMS Magic Interact based on your valued inputs. We understand that navigating away from any screen for some action actually cause a loss of context. To save your clicks and time, we have come up with sleek pop up screens for composing SMS on the same screen. It carries all the previous features, and still makes your life easier. 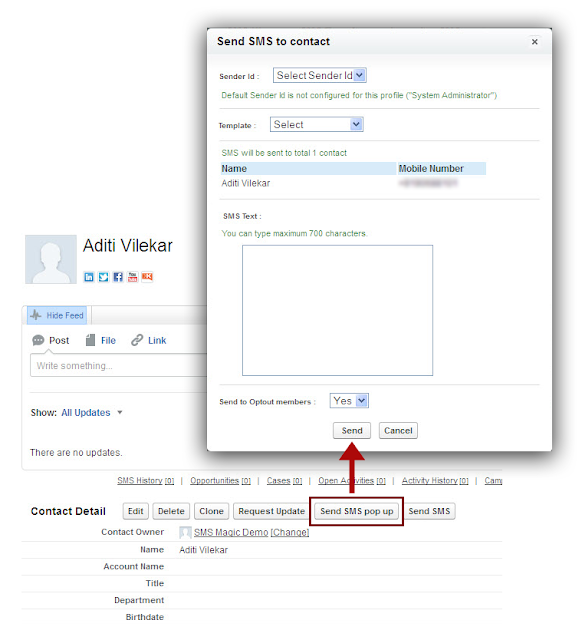 Added errors messages to notify if mobile number is missing or invalid mobile number. The application gives you very straight and to the point error logs, to help you understand where things went wrong and how to correct them. The whole new bunch of error logs is created to save your time and guide you to success. 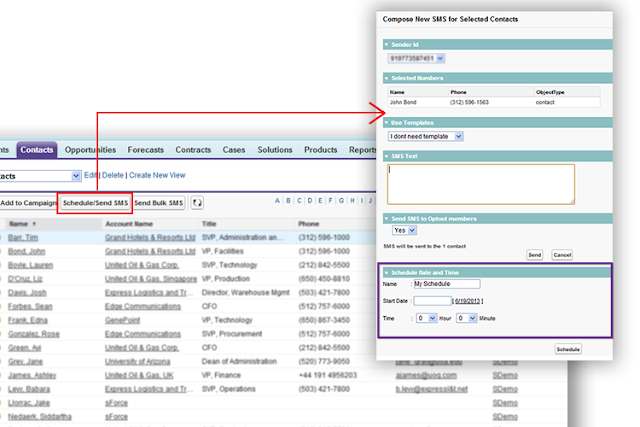 It is indeed tiring to manually update the contact status every time a contact decides to opt-out. The new version gives you the facility to define keywords such as “STOP” or “Unsubscribe” which help to define a workflow rule/ trigger an action to automatically opt-out the responder. These two brand new features allow you to send messages for predefined triggers. You can define workflow rules and create a related task to send messages. We are sure you must have had to make some tough choices like choose one critical task over another scheduled to occur at the same time and we can completely relate to that dilemma of. With our new SMS Scheduler, you will never again have to choose the more pressing one (as long as one of the two is about sending messages). Just schedule your messages to reach your target audience at a time you want. What’s more you can even schedule messages to be sent on holidays! Q: For which editions of Salesforce is the upgrade available? A: For Developer edition, Production and Sandbox environments of Professional, Enterprise and Unlimited editions. Q: Will the upgrade allow more users to use the app? A: User permissions will remain the same as were in previous versions of package. Salesforce Administrator can manage user's access to SMS Magic Application. There is no restriction from our side. A: For customers already subscribed to SMS Magic Interact, there will be no additional cost. You can directly upgrade the package. For customers using Basic version of the application, please get in touch with our Sales team at [email protected] for upgrading your package. Visit Interact Pricing for detailed pricing. Q: How will the upgrade affect my current eco-system? A: There are no major changes in the working of application. This version is more user friendly and interactive. Q: Will the upgrade erase the previous data? A: For customers using SMS Magic Interact with package prefix "smsmagicinteract__" and having application version greater than 1.20, it will be just point and click update which will update changed package components and data will remain as it is. Q: Will my company experience any downtime? For how long? A: There will be downtime of upto 5-30 minutes depending on the type of upgrade. If it’s a point and click update, it will not take more than 5 minutes to install new package. However, if there is need to backup old data and then reloading it back to Salesforce, it might go up to 30 minutes. Q: Does my team need any additional training to use the new version? A: No, the basic functionality of application is still the same. If you are looking to implement new interface (pop-up), then you might have to train your team on it. Q: Will the security of my data be affected by the upgrade? A: No! It is as secure as it can be! All data transmission happens over secure SSL protocol. Refer Q.19 from our application FAQ's for more details on this. Q: How Do I Upgrade to new version ?